I love small towns. I like driving the countryside and passing through different towns as I go, wondering about the people in each town and what it would be like. Luckily for me, I have a second job as a broadcaster for a high school team in a small town. I’ve been involved in covering high school football in some way for almost 30 years now. And to this day, I still get excited every Friday during football season. There’s nothing quite like it. I love both the football, and seeing a part of small town life each week. 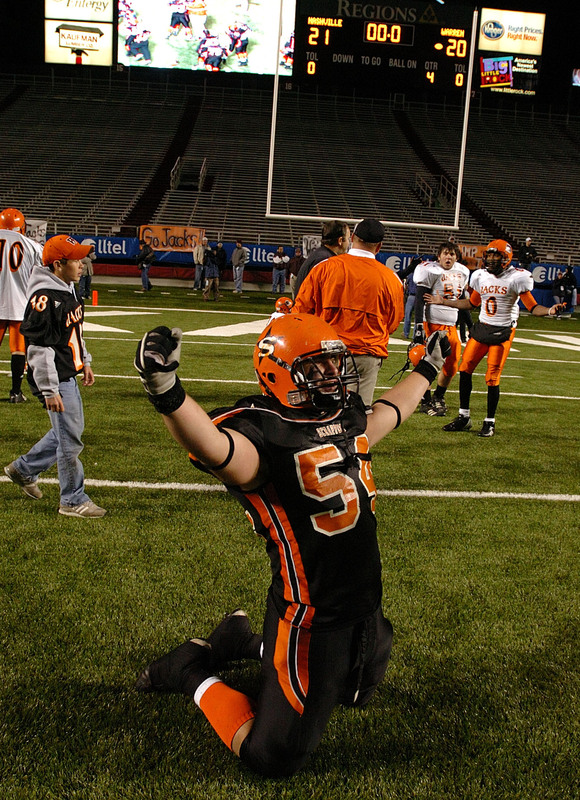 One of my favorite moments – a Nashville player celebrates a state title following a controversial win with the scoreboard telling the story in the background in 2006. I started while I was still in college. During a high school game for my alma mater, I went to the press box, introduced myself to Tom “Terrific”, who was broadcasting the games, and he asked me if I’d like to join him on the air for the game that night. From there on, I was hooked. Today marks the first Football Friday for high school teams in Arkansas this year. And I’m just as excited to be broadcasting a game tonight as I was back in 1984. For me, every Friday is an event. Probably because it involves more than just a game. For years I I’ve covered the football team for Nashville High School – the Nashville Scrappers. First, there’s traveling to the game. And that’s followed by one of my favorite parts – the pregame meal. One of my favorite things to do is try small, out-of-the-way places to eat. So my football travels fit this perfectly. Over the years, I’ve been fortunate to find some really good food, in some really small towns. Yeah, there’s been a bad meal from time to time, but usually the food is good. And I always enjoy watching the locals – the families come in, usually wearing their team’s colors. They, too, are getting set for the game, excited is they get set to watch their son play. Or their daughter cheer. Or their son or daughter in the band. It is, at its core, small town America at its best. Then the game itself is just as fun. I have a number of people I like to visit with before the games. For the first game tonight, there will be some that I haven’t talked to since last season ended. There will be coaches I’m looking forward to talking to, and fans who always expect the best as the season gets underway. There’s nothing quite like high school football in a small town. It’s hard to beat for the tradition at each school, and the pure excitement and enthusiasm of the players and fans. I’ve covered and broadcast games around the state, once entering a closed-up pressbox that had to be close to 150 degrees on a hot day in late August, to shivering through a broadcast a game on top of a press box in November in northwest Arkansas, where the temperature hovered around 20. And it seems I’ve been to games everywhere in between. And I’ve been fortunate to see some excellent games, so great young players (with several who went on to play in college, and a handful who have gone on to play in the NFL). And I’ve seen some great endings – some wins, and some losses for the teams I’ve covered. And some even controversial. I saw one such game in the quarterfinals of the state tournament last fall. Nashville lost to Prairie Grove, on a cold Friday following Thanksgiving. The stands were packed, and fans for both teams were on their feet, cheering the entire game. It might have been an attempt to stay warm, but it made for a great atmosphere. Players for both teams played hard, and a back-and-forth game ended with Nashville losing. Following the game as I was making my way out of the stadium, most fans had already left. But there was a small group of fans from Prairie Grove talking near the exit. As they saw me leaving, they said something about what a good game it was. I told them, you know, you just can’t ask for a better game. Great fans. The kids giving it their all. It was games like this one that made me love high school football. Last year, I added a new dimension to broadcasting high school football – my son went to his first game and joined me in the press box. And he loved it. I think part of the appeal for him was getting to sit up high in the press box. And, of course, the pizza and snacks from the concession stand. I’m looking forward to another year of broadcasting high school football. (If you’d like to listen to the game, you can tune in at www.southwestarkansasradio.com). And with my son going, it’s going to be my best season yet. the story. I was surprised that you aren’t more popular since you surely have the gift.